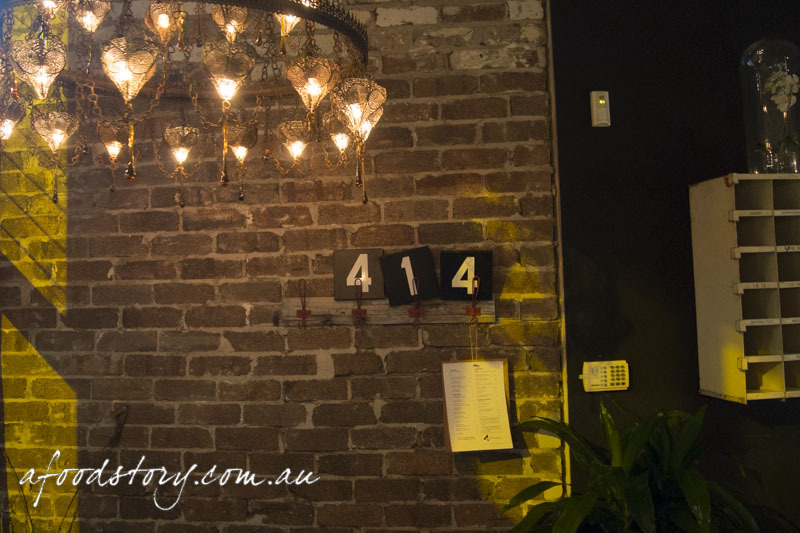 Back in 2011 we dined at The Four in Hand Dining Room and have always talked about checking out 4Fourteen. But we talk about a lot of restaurants and of course it just ended up on that never ending list of ours. When the New Yorkers were in town they’d flagged 4Fourteen as a place they’d like to visit. So all these years later we finally got to tick 4Fourteen off the list. Iggy’s Bread with Butter ($2.50). With Iggy’s bread on the menu I have to admit I was expecting a slice of Iggy’s unbeatable sourdough. I wasn’t expecting a bread roll and have to admit I was disappointed. Quite firm and dry the bread roll didn’t live up to Iggy’s sourdough standards. I probably should have saved it to mop up all the delicious juices from the mains but when bread lands on the table I jump straight in. Oh well, next time. Ham Hock and Cheese Croquette, Mustard Crème Fraîche ($4.50 each). Before we got into meat, meat and more meat we kicked things off with some ham and cheese croquettes that Marcos just couldn’t go past. They arrived smelling wonderful and cutely presented in an egg carton offcut. With their rectangular shape reminiscent of fish fingers I had to throw my expectations out the window. There was no fish here. Ham and cheese certainly are a marriage made in heaven and the ham hock brought its wonderful smoky and robust flavour to the gooey melted cheese counterpart. 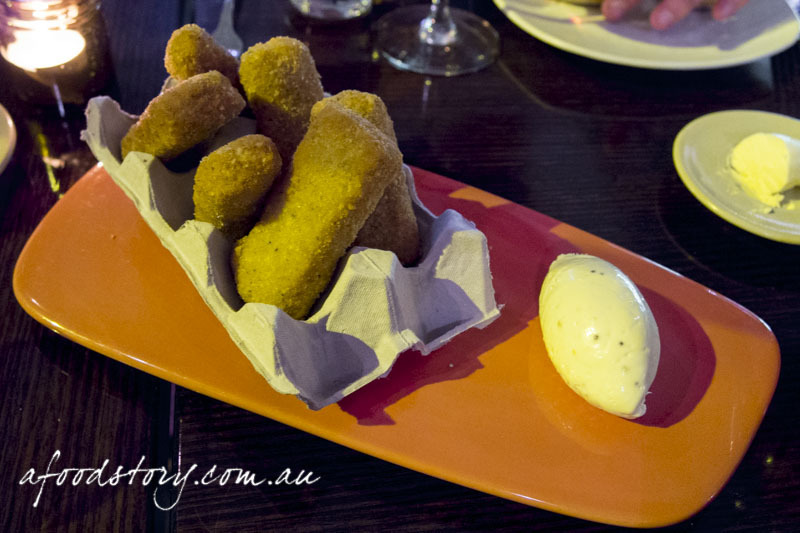 A quenelle of mustard crème fraîche helped cut through the richness of the deep fried batons. A classic flavour combination yes, but they had nothing on those lamb croquettes we devoured at County Dining. Pork Belly, Pumpkin, Charred Onions, Prosciutto ($32.00). Somehow the pork belly left the kitchen early. In a rather dimly lit restaurant it wasn’t easy to spot at first but as Dylan started snapping pics he realised something was amiss. 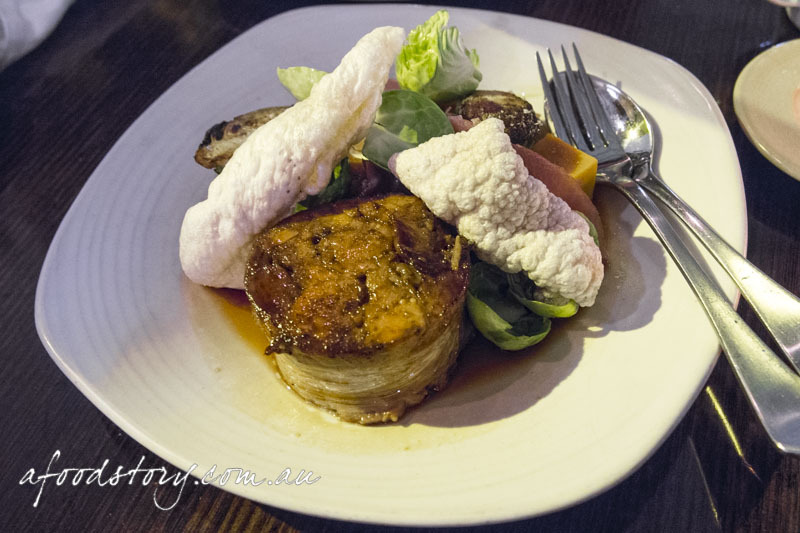 Just as he did a waiter came flying back from the kitchen – clearly they knew the dish hadn’t meant to leave the kitchen when it did – there was still cling wrap encasing the pork. Delicately removed before we had a chance to dig in, no harm done. Before us was a cylinder of glazed pork belly, brussels sprouts (one of my favourite vegetables – yes, even as a kid I loved them! ), cubes of pumpkin and charred, caramelised onions. The veggies balanced the pork well and it was nice to see pork belly done in such a different way to the norm. With both the sprouts and onions charred there was a wonderful caramelisation going on that worked nicely with the salty prosciutto and buttery soft pork belly round. 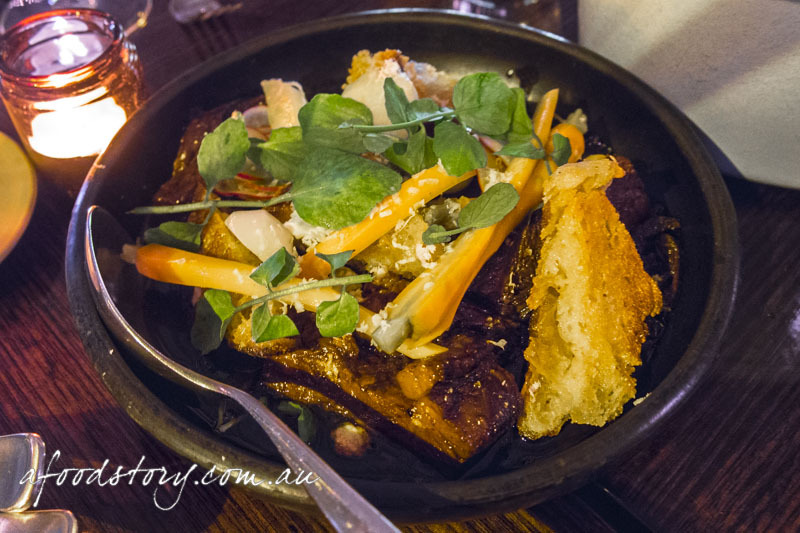 Liquorice Beef Brisket, Pickled Veg, Fried Bread ($38.00 small). Golden and glistening fried bread was the first thing I noticed as the brisket hit the table. But the aromas coming from the dish were beef, beef and more beef. My favourite protein. A thick slab of brisket slow cooked until it fell apart at the slightest nudge. Liquorice added to the beefiness in ways I’ll never understand but always appreciate, with that little hint of aniseed. Pickled veg sounded like a great addition to cut through the richness of the beef but as always I avoided anything pickled and let the others get their daily dose of veg while I devoured more glorious, tender beef brisket and crunchy, buttery, fried sourdough. 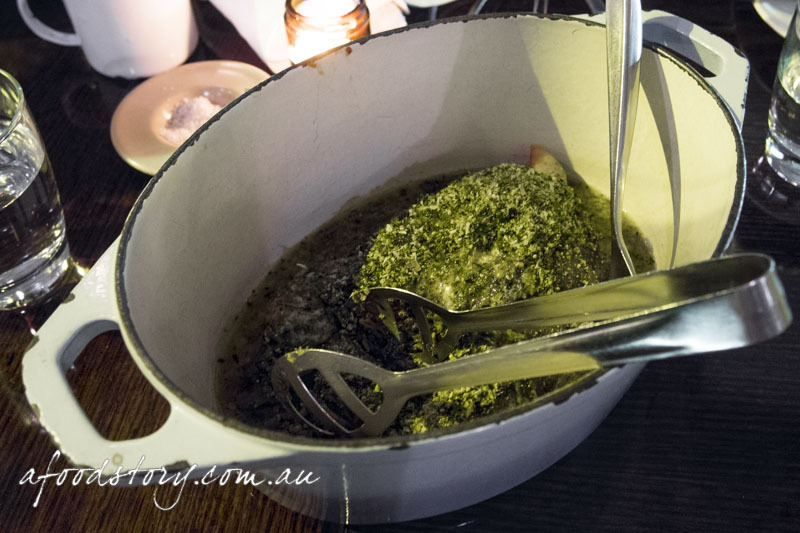 Slow Braised Whole Lamb Shoulder, Mustard and Herb Crust ($72.00). But wait, there was more meat. Yes we possibly ordered a little heavy on the meat front but we couldn’t decide between the pork or beef and everyone wanted the lamb. Ahh the lamb. Slow braised lamb shoulder to be precise. Colin Fassnidge is most known for his skills with the almighty pig, but don’t overlook the lamb. Under a blanket of herbs the whole lamb shoulder was served in a rather large Dutch oven with a pair of tongs for dishing up. Slow braised for six hours the lamb shoulder was melt in the mouth tender and easily the best protein of the night. It was lovely to have a simple braise provide so much satisfaction. All elements helped make this the wonderful dish that it was. Making sure you got some parsley and mint from the herb crust with the lamb ensured it was nice and bright, and the light hints of mustard helped it much the same, resulting in a well balanced and not too heavy dish. 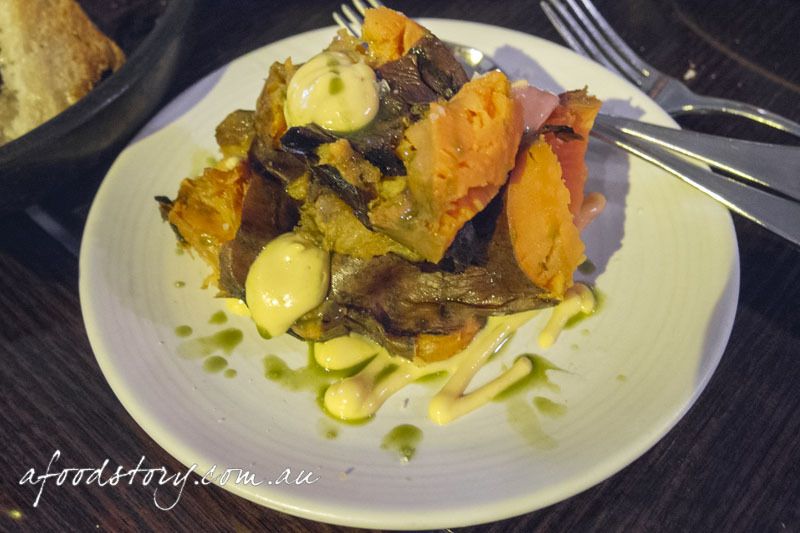 Charred Salt Crust Sweet Potato, Smoked Potato Mayonnaise ($12.00). With all that meat we had to have some veggies. There’s nothing quite like root vegetables to go with hearty Irish fare and the charred salt crust sweet potato was a great side. Blackened and charred on the outside, buttery and soft on the inside. Quite a simple dish using nice technique, the salt crust drew moisture out to help crisp up the skin, resulting in a salty, crisp, addictive number taking sweet potato to the next level. Quite content without any condiments I left the mayonnaise to the others who tell me the sweet potato was even better with the smoky and creamy mayo (I’ll take their word for it). And of all root vegetables there is nothing that comes close to the potato. From jacket potatoes to boiled spuds, potato salad to potato bake, and chips to mash, the humble potato is the most versatile veggie of them all and no one knows that more than the Irish. 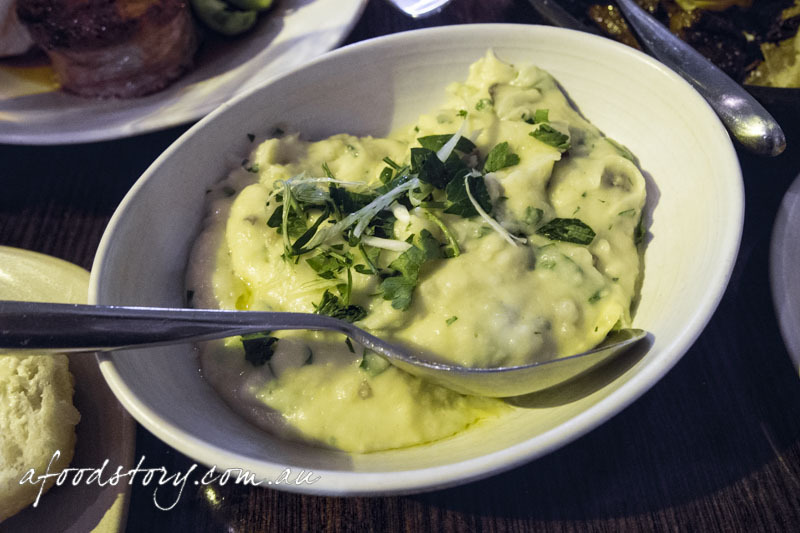 Colcannon is where it is at. Potatoes, cream, butter. Add some cavolo nero and spring onion, sprinkle with parsley. One mouthful of this took me straight back to The Four in Hand. Best. 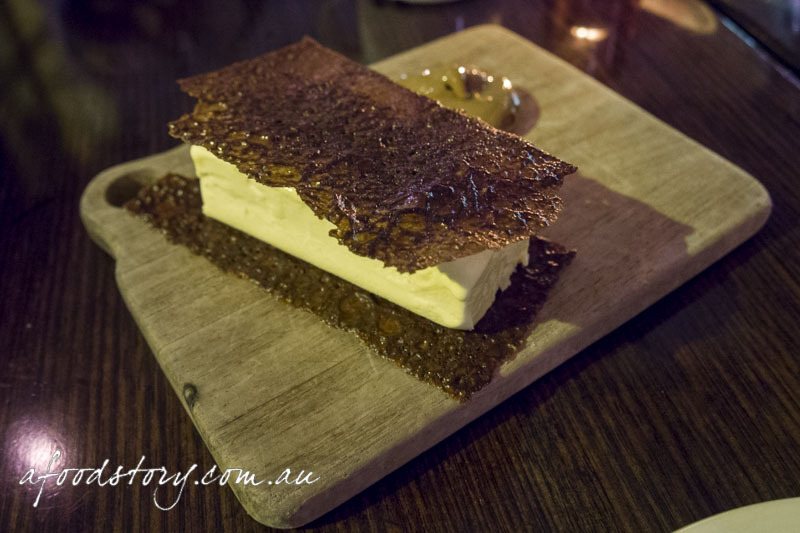 White Chocolate Sandwich, Dulce de Leche ($16.00). At the end of the night I was satisfied but left a little underwhelmed. I’d heard so many great things about the place I was expecting it to knock my socks off. 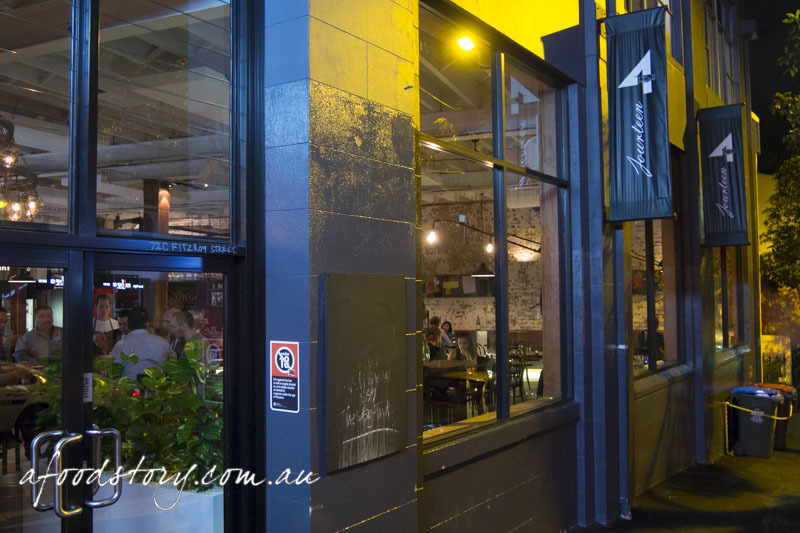 But with the likes of Nomad and MoVida opening up not far away there’s so much competition in Surry Hills these days I don’t think I’d rush back. 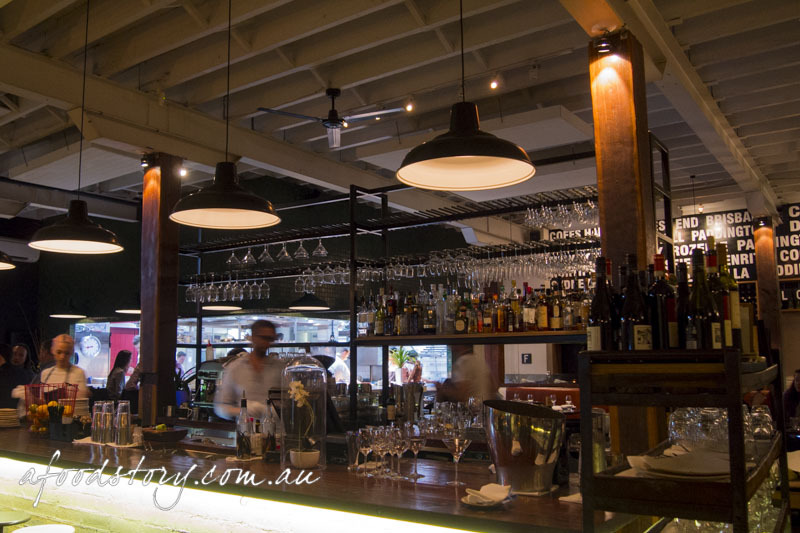 Don’t get me wrong the food is enjoyable but I’d rather head to The Four in Hand for my next fix.